I'm sure that there must be some good parts to Cyprus, but halfway through our September week there and we hadn’t found it. 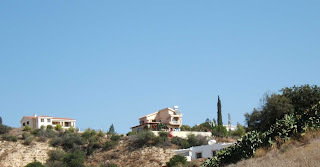 Cyprus is hot, arid and underwhelming. In its favour they drive on the proper side of the road, the electricity is British three pin plug style, and at British strength. The pillar boxes and phone boxes are also from a British mould but yellow and green respectively. Unfortunately much of the plumbing is Greek. You can understand why a certain sort of brit loves to holiday and retire here as it is a sort of little England in the sun. You've got household names here like Marks & Spencer and Debenhams plus US fast food establishments like KFC, Starbucks and the ubiquitous MacDonald’s. If you are a lager drinking Sun reader or a wine drinking Daily Mail reader you could live a 'normal' lifestyle here without ever having to subject yourself to "foreign muck" or be in danger of exposing yourself to any meaningful culture. Large proportions of the leather-skinned ‘ex pats’ seem to live in ghettos; reasonably specified ghettos admittedly, but ghettos all the same. Many of them will be the bigoted twats that will have criticised and felt threatened by immigrant communities when they lived in the UK. Personally I care not for isolationist ethnic communities wherever they exist. I understand why it happens and depending in which country you are in it can often be born out of necessity but segregation can never be right whether it be forced or voluntary. To get the most out of where you live you need to be part of a wider society. 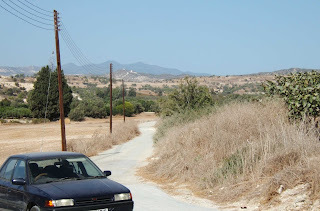 Later on in the week we went up to Nicosia and crossed over to the Turkish Republic of Northern Cyprus. The Turkish part is stuck in time (early 1970s really) and quite charming as well as being somewhat dilapidated in parts. A certain rough around the edges charm. We had a wonderful lunch sitting under the trees between a mosque and a church. I am assured that during the winter Cyprus greens up nicely, and I can quite believe it. No doubt during the winter it must be a reasonably pleasant place to be, but not so the rest of the year. If your idea of heaven is a hot dusty rock of an island, four and a half hours away by plane, where most of the buildings are boring concrete blocks and the beer is classically bland lager, then Cyprus could well be the place for you. As far as I’m concerned I have no plans to ever go there again.